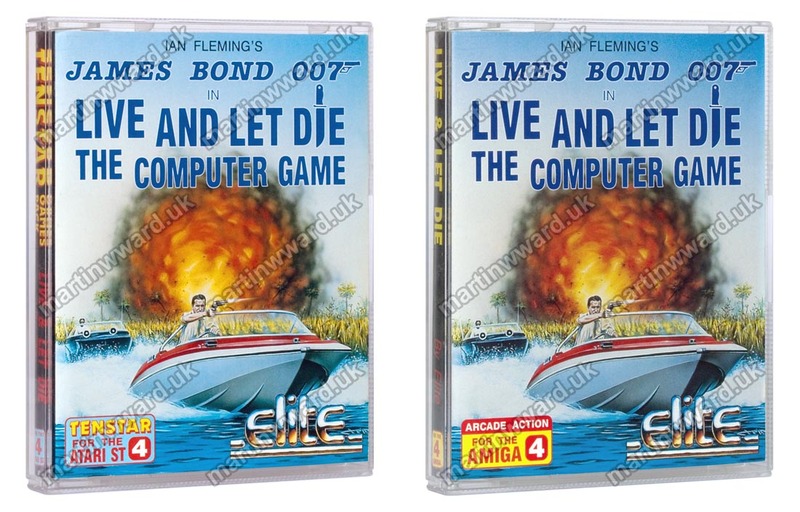 Live and Let Die is a video game of the classic James Bond movie. It is a 3D-perspective first person speedboat action game, featuring 4 obstacle-filled courses. 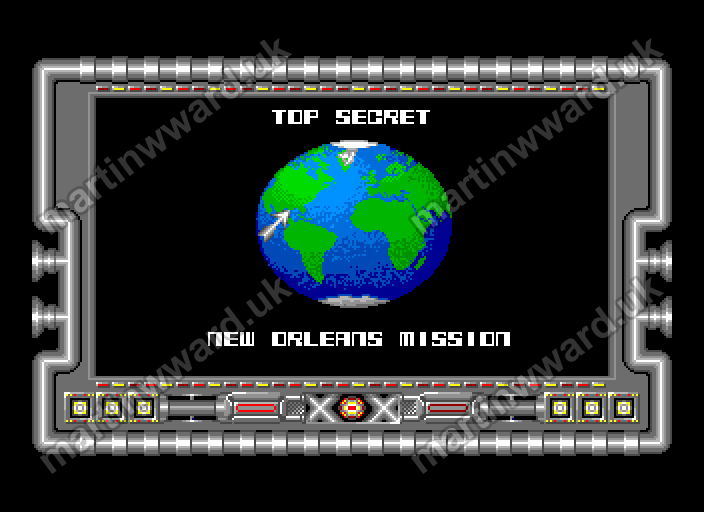 M has given you the top secret mission: "Find Mr Big, and don't come back until you do". Q has given you his latest gadget: "Be very careful with it 007. It is the fastest and most dangerous speedboat ever made. Just to make sure you find Mr Big, we have arranged some practice sessions for you in extreme conditions. You'll go from Desert to the Icebergs before we let you loose in Florida - Mr Big's home country." 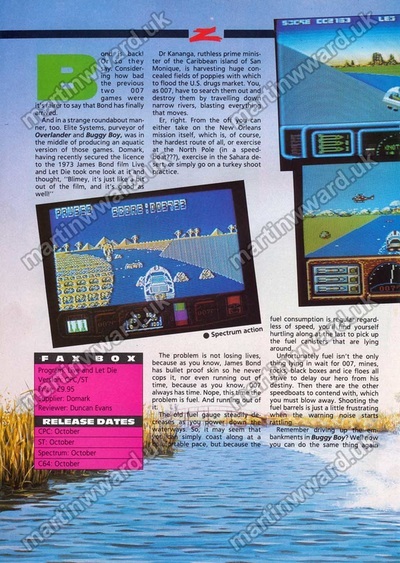 As James Bond, the player must travel along the various waterways; Target Practice, New Orleans Mission, Norwegian Fjords and Middle East Desert exercises. In the Target Practice section, the red targets must be shot with the forward mounted machine gun, the black targets must be shot using missiles. There are two exercises that enable Bond to learn about the type of defence systems used by Mr Big (aka Dr Kanaga), and finally the mission which is bristling with Dr Kanaga's defences. 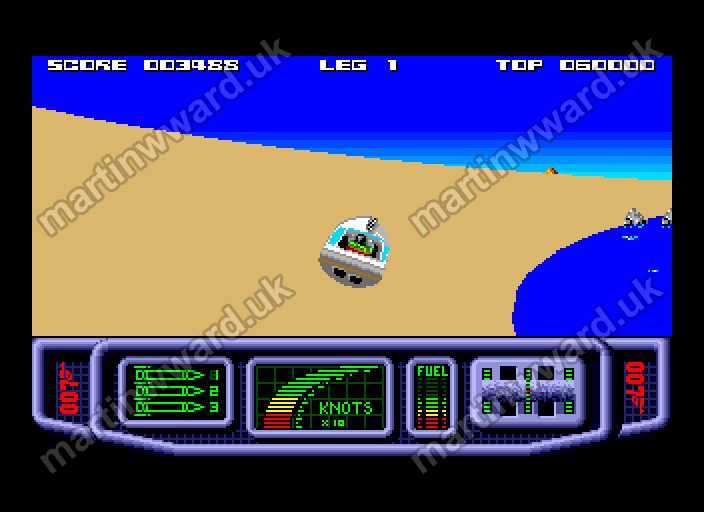 The player must avoid mines, gun emplacements, dive-bombing enemy planes, and enemy boats, some of which drop mines or booby trapped fuel barrels and can only be destroyed with a missile. 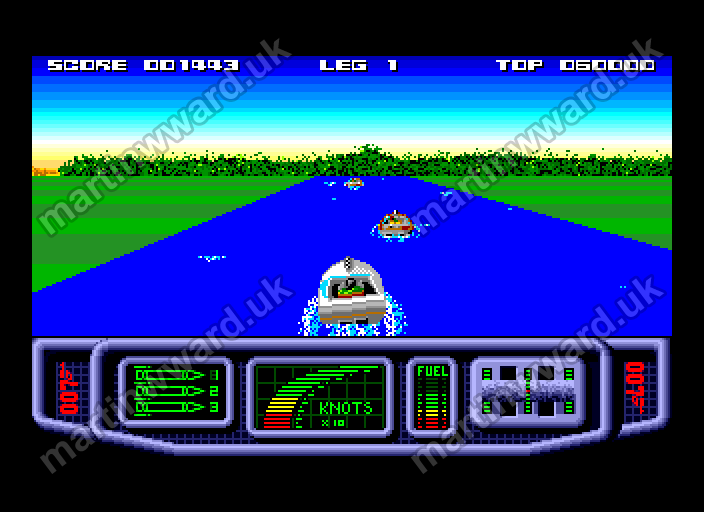 Enemy aircraft can be destroyed by launching the boat into the air off a log and then releasing a missile. 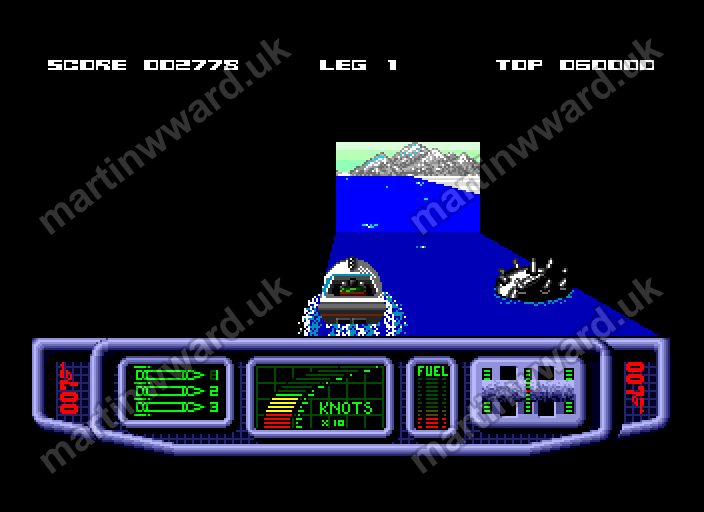 The player can slide James Bond's speedboat up slopes to avoid obstacles and destroy closed lock gates with missiles. 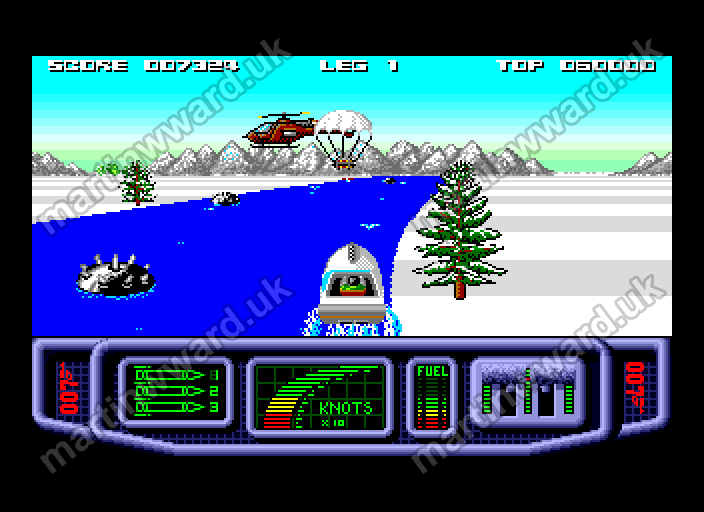 Along the way, the player must pick up fuel by driving over fuel barrels, as well as the crates that contain fuel and missiles dropped by the C.I.A. helicopters. 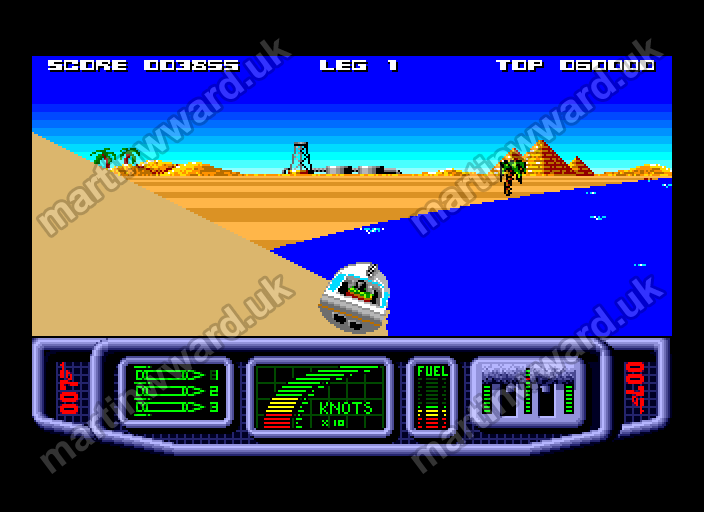 The player's speedboat must travel through dark tunnels, avoiding mines and other obstacles. With a lot of skill and some luck the player will eventually reach the illegal processing factory at the end of the waterway. 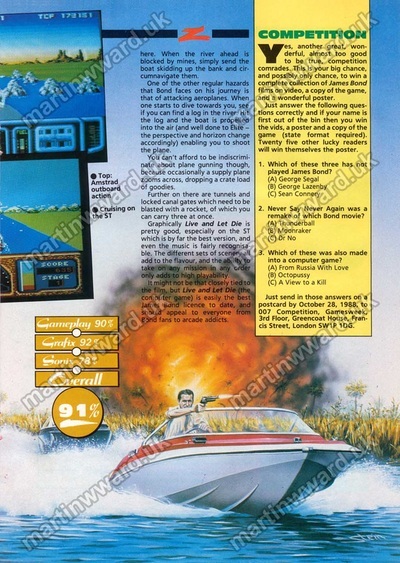 The factory can only be destroyed by the boat leaping off a log into the air and letting off a missile to finally destroy the evil Dr Kanaga's installations. The game started life under the name Aquablast. However, shortly before the game was released, a rival software publisher became involved in the project. 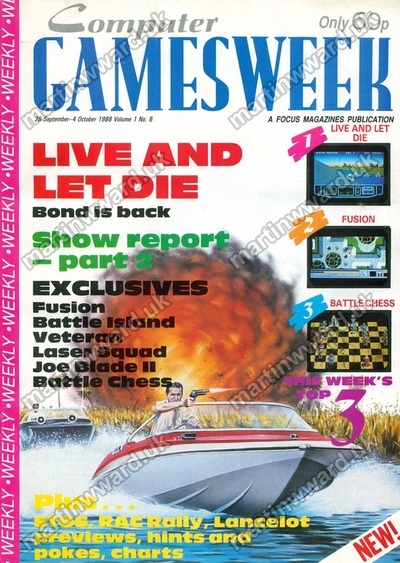 After hearing how well Elite were progressing with Aquablast, and after seeing a demo of Martin's Atari ST Aquablast, Domark successfully negotiated with Elite to publish Aquablast under the Live and Let Die name. At that time, Domark were in possession of the James Bond video game licence, and they saw how closely Aquablast resembled the speed boat chase in the Live and Let Die film. 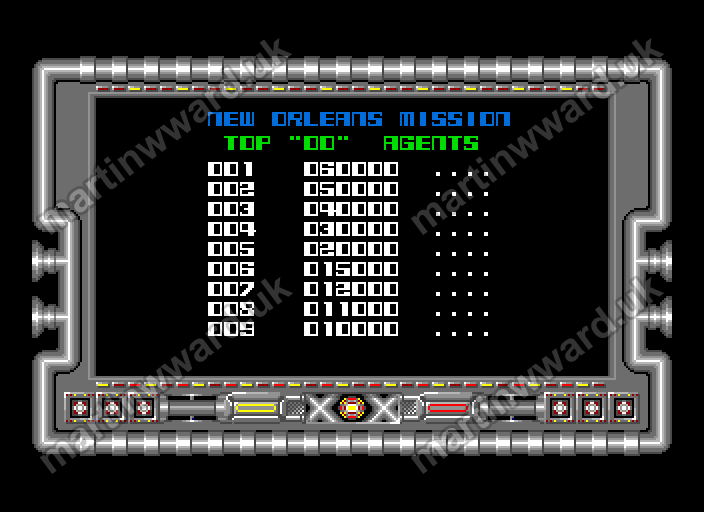 The agreement was also to Elite's advantage as, historically, licensed games had tended to outsell games without a famous licence attached. Only minor modifications, mostly to do with branding, were needed to produce the game that was eventually released. 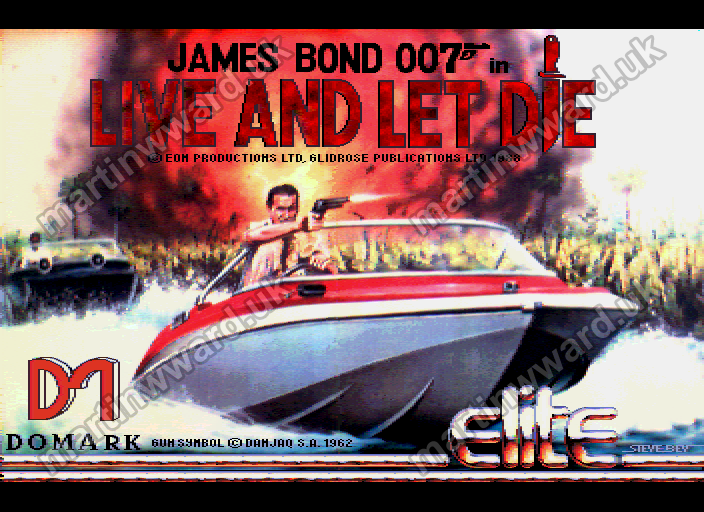 Domark did not have the rights to the James Bond title in America, consequently Elite distributed the game in the USA, without the James Bond branding, under the game's original name of Aquablast. 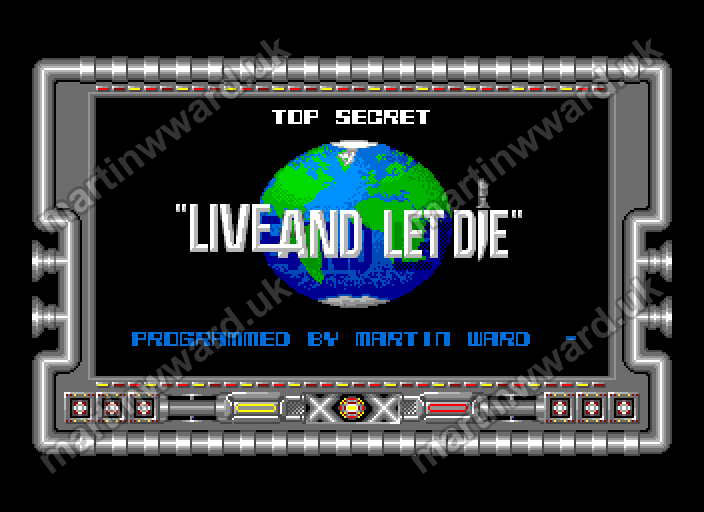 To develop Live and Let Die, Martin built upon the 68000 code base that he had developed for Buggy Boy. Many of the game's elements are similar to those in Buggy Boy. There are tunnels, walls, and embankments, and in place of bridges over water, Live and Let Die has narrow stretches of waterway. a triple-buffered screen - this greatly improves the smoothness of the animation by increasing the effective frame rate (triple-buffering allows for screen drawing to continue without the need to wait for vertical blanking when switching screen buffers). 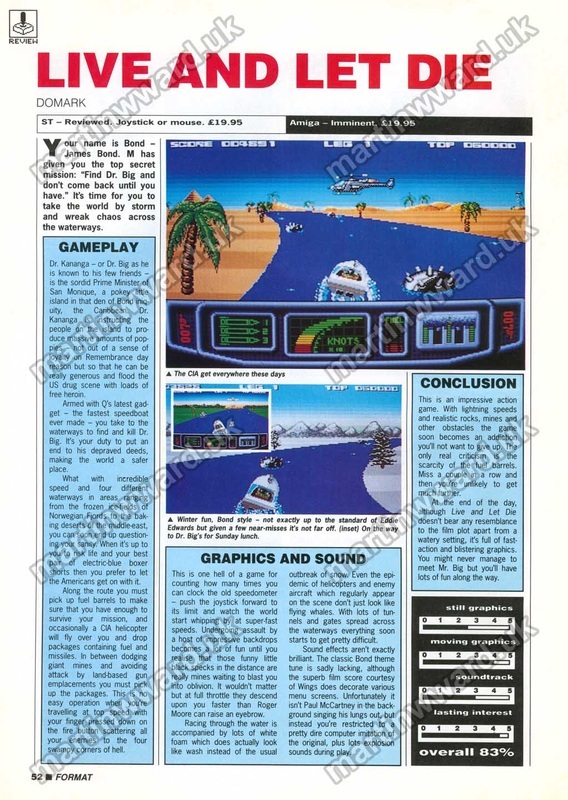 the whole game display moves up and down in sync with the vertical position of the player's speed boat - this makes bouncing the boat into the air off logs and ramps visually more dramatic. 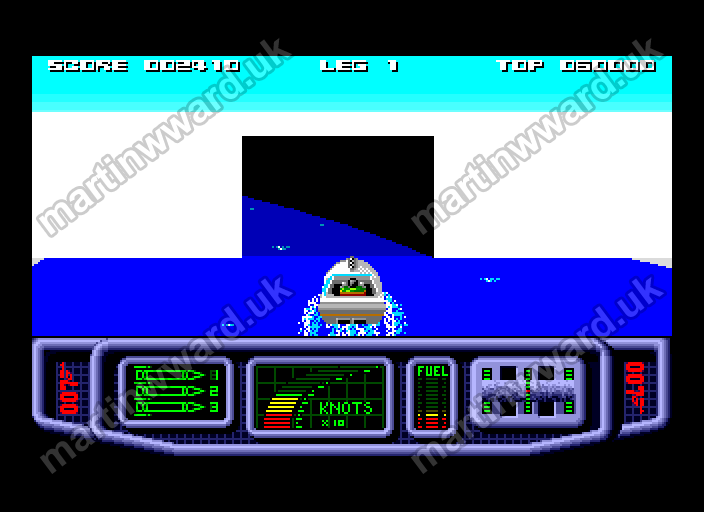 horizontal line interrupts on the Atari ST, and copper lists on the Amiga, were used to change colour palette values on a scan line basis. This facilitated spectacular colour-gradient skies, and palette darkening inside tunnels. smooth sprite scaling, using vertical interpolation techniques, gives a much improved 3D effect to approaching sprites. 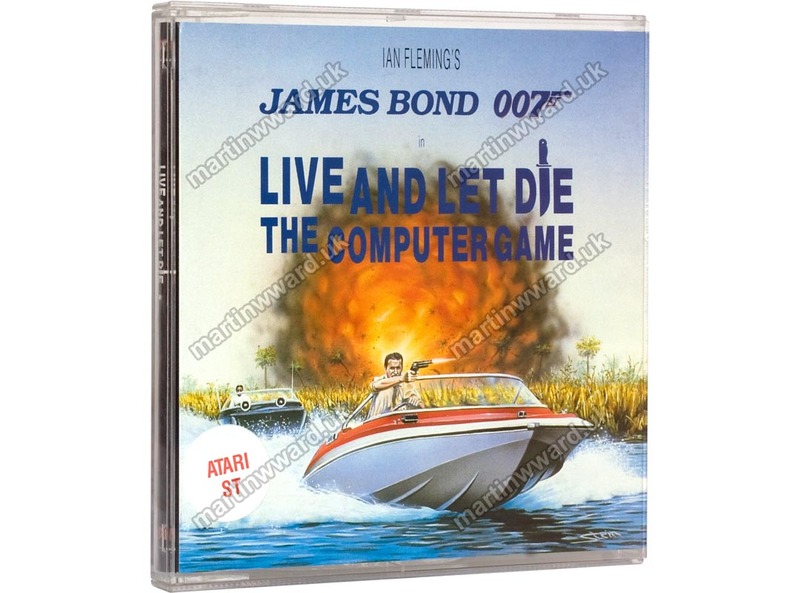 Live and Let Die (the computer game) is easily the best James Bond Licence to date, and should appeal to everyone from Bond fans to arcade addicts.